The girl next door has a wooden sword, and she is out for blood. It is by no means difficult to end up on the hit list of this palmtop tiger. A misplaced letter might do the trick, actually. Many innocent lives would certainly be saved if someone taught Aisaka Taiga a way to deal with love problems other than through violence. 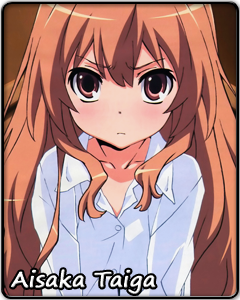 Clumsy, short-tempered, and vengeful is a dangerous combination, and it describes one side of Aisaka Taiga perfectly. But the other side is a tiny teenager living all alone in a vast apartment, a love-struck girl putting the good name of her friend before the matters of her heart, and a relentless competitor abandoning a contest to help a person in danger. Taiga is fierce on the outside and fragile on the inside. But that is only one way to put it, and it belies the way she bears the pain of loneliness, how she stands up, without fail, every time she falls or how she finds the courage to trust once more after getting hurt time and time again. Understanding Aisaka Taiga means seeing the strength behind a trembling smile and tasting salt in too-sweet vanilla ice-cream.